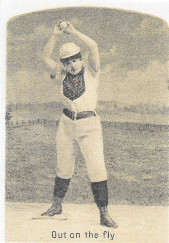 These cards feature women baseball players in a variety of poses. The women are not actual players and the pictures in the set will be familiar to experienced pre-war collectors that focus on early women’s baseball issues. with a short caption. Currently, only three cards are known to exist in the set. Pictures are similar to, or possibly even the same as, the N48 Virginia Brights Polka Dots cards as well as Virginia Brights’ Crop of 1884 Polka Dot Nine cabinet cards. Like those issues, these trade cards feature women with various polka dot baseball apparel. The exact date of the cards is unknown. But given the similarity in photos to the Virginia Brights issues, these are likely to have been produced in the mid 1880s. In the spring of 2018, I discovered a new unchecklisted card in the series. Previously, only two had been known. But a third one appeared, titled, “Out on First,” growing the checklist by one. The card features a female first baseman with a ball with a runner on the base. As I wrote at the time, it is unlikely that the checklist is complete at three cards. The pictures were used on other popular Virginia Brights series’ that featured more cards. Specifically, each of the other two sets I mentioned have nine cards. While certainly possible, it makes little sense for this set to be produced with only three cards.